Adidas Extreme Power Special Edition gives a feeling of freshness and energy. Adidas Extreme Power Special Edition 100ml. 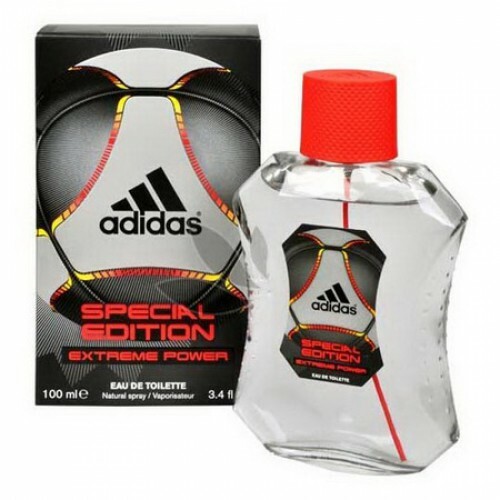 - Reflecting the feeling of the excitement, instinct and stamina for the game with its aromatic-woody composition, the Adidas EDT 100ml Extreme Power Special Edition is an overture to the European Football Championship. It opens with an energizing twist. Citrus-woody fragrance from Adidas will become a worthy choice in the world of perfumery for every man. He will be in harmony with the man at business meetings, on long business trips, on evening walks or meetings with girls. With such perfume, a man is ready for anything, he has every barrier on his shoulder. Its aroma radiates pleasant echoes of lemon, bergamot, coffee and a green apple. It would seem that this is a very strange combination, but if you add geranium, sandalwood and patchouli to it, everything falls into place. Adidas Extreme Power will pleasantly surprise you. All around will pay attention to your scent after you go into the room. Adidas Extreme Power is quite sturdy and daisy, it feels masculine and powerful. The smell of a real man who emits light and joy, conquers women and strives for success, no matter what. The fragrance is daring, fresh and ultra-modern. It opens with notes of galbanum, bergamot and lemon, which is replaced by captivating geranium, green apple, diluted with strong coffee, and warm cedar, vanilla, sandalwood and patchouli give sensual plume. Adidas Extreme Power - charge of vivacity for the whole day.